In 1977, Melissa Ludtke, a female sports reporter for Sports Illustrated magazine, filed a civil rights action against Major League Baseball Commissioner for the New York Yankees. The action sought to prevent the New York Yankees from enforcing a ban of accredited female sports reporters from entering the team clubhouse in Yankee Stadium. The Court determined that the policy violated Ludtke’s fundamental right to pursue a career under the equal protection and due process clauses guaranteed by the Fourteenth Amendment. 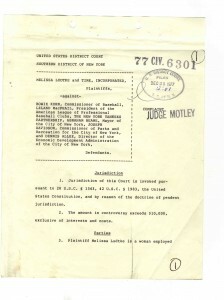 Complaint from Melissa Ludtke and Time, Incorporated v. Bowie Kuhn, Commissioner of Baseball, et al. ; Court case to provide equal access to athletes for women sports reporters, 12/29/1977. National Archives, Records of District Courts of the United States. This document is being featured in conjunction with the National Archives’ National Conversation on Women’s Rights and Gender Equality. Special thanks to Perkins Coie for their support in this event in New York City.